Dec. 20, 1907, p. 4, col. 4. Confident, However, That Wireless Telephony is Entirely Possible. I have read with great interest the report in your issue of to-day that the Danish engineer, Waldemar Poulson, the inventor of the interesting device known as the "telegraphone", has succeeded in transmitting accurately wireless telephonic messages over a distance of 240 miles. I note other improvements of mine, but those mentioned will be sufficient to show that Denmark is a land of easy invention. The claim that transatlantic wireless telephone service will soon be established by these means is a modest one. To my system distance has absolutely no significance. My own wireless plant will transmit speech across the Pacific with the same precision and accuracy as across the table. The Ewing high-frequency alternator and Parsons steam engine - Electrician, London - Dec. 17, 1892, p. 391. Edison Becomes Marconi's Ally - New York World - May 28, 1903. Electric autos: Nikola Tesla’s View of the Future in Motive Power - Manufacturers’ Record - Dec. 29, 1904. 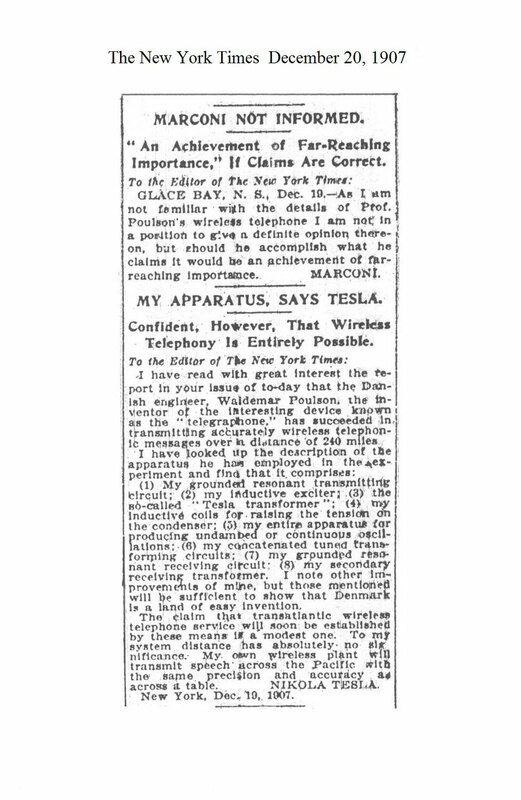 My Apparatus, Says Tesla - New York Times - Dec. 20, 1907, p. 4, col. 4. Will Tesla's New Monarch of Mechanics Revolutionize the World - The Washington Post - October 15, 1911. Breaking up Tornadoes - 1933-12-?? Nikola Tesla and "force rays" - The Ironwood Daily Globe, Ironwood, Michigan, Page 4 - Tuesday, July 17, 1934. The "Tesla death beam" - The Lethbridge Weekly Herald, Lethbridge, Alberta, Canada, page 9 - Saturday, July 16, 1938.